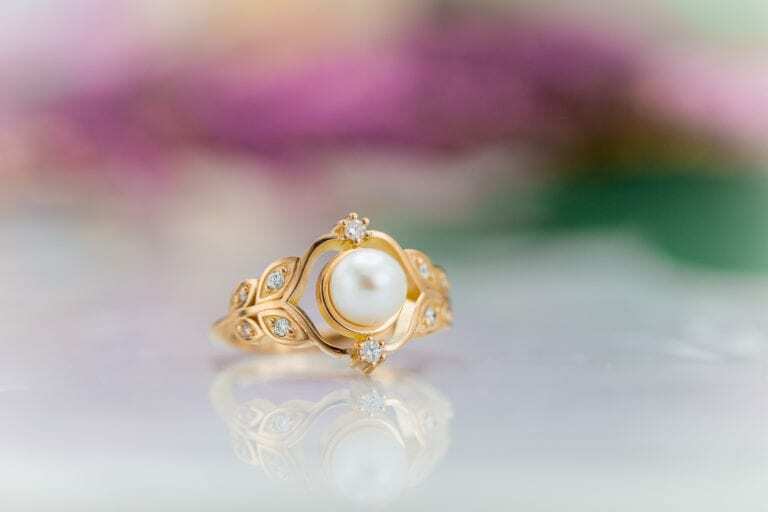 Blending 14k yellow and white gold creates great contrast in this Celtic-inspired design. 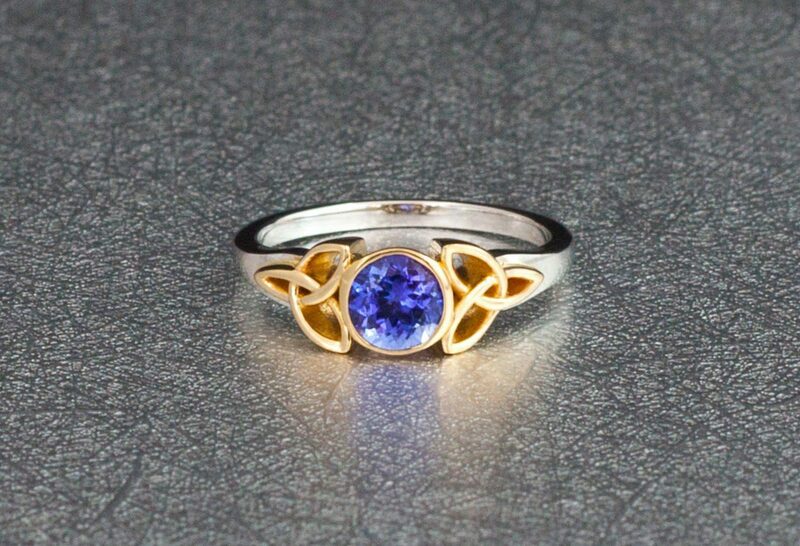 The yellow gold setting complements the purple-blue tanzanite perfectly. A low-profile bezel setting ensures the tanzanite is well protected and unlikely to snag with daily wear. © CustomMade. Used with permission. Tanzanite has had a rapid rise to prominence among jewelers and gem enthusiasts. Although naturally reddish brown, this transparent zoisite variety achieves a stable, beautiful blue to violet color wth heat treatments. 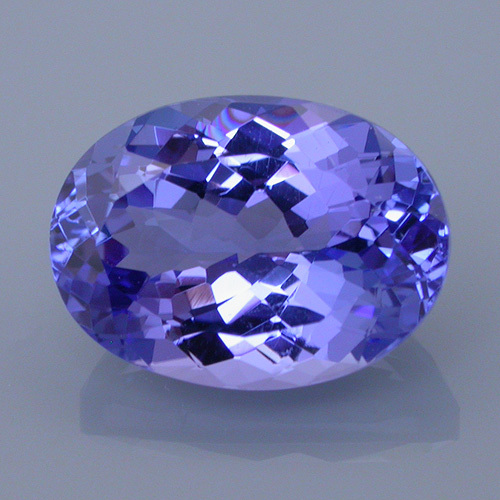 In general, tanzanites showing more blue are valued higher than those showing more violet. Medium dark colors are the ideal. Custom cuts add value. As always, size and clarity have a strong effect on prices. Large clean rough is extremely scare. Ultra-rare cat’s eye tanzanites are highly prized. See our tanzanite buying guide for more detailed value information. Tanzanite colors (and a green zoisite). 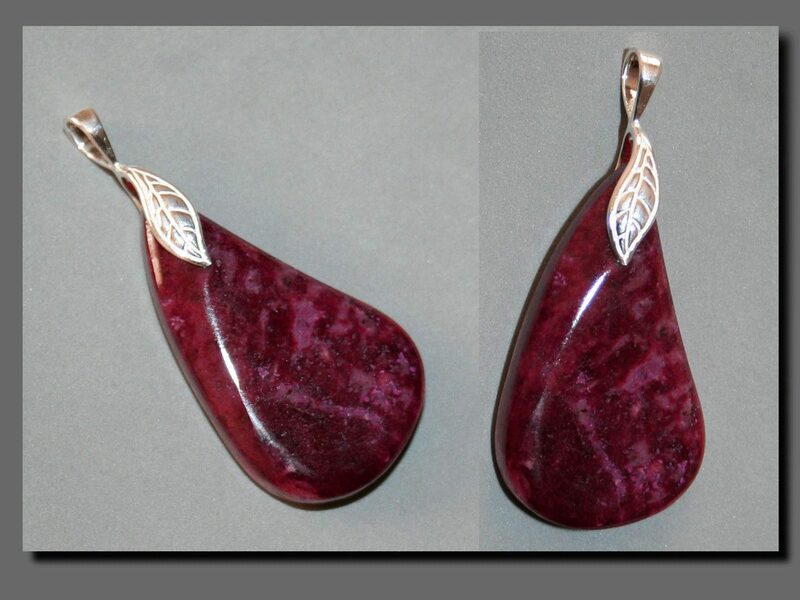 Photo courtesy of Barbara Smigel, Artistic Colored Stones. 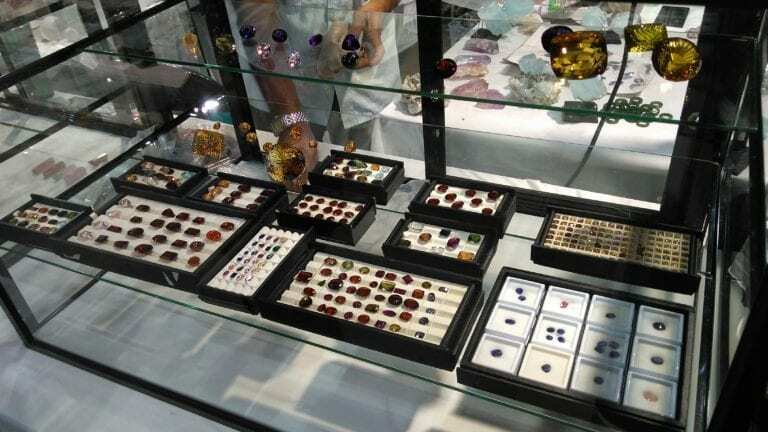 Colors Gem-quality zoisites can be gray, green, brown, pink, or yellowish. Thulite can be pink. 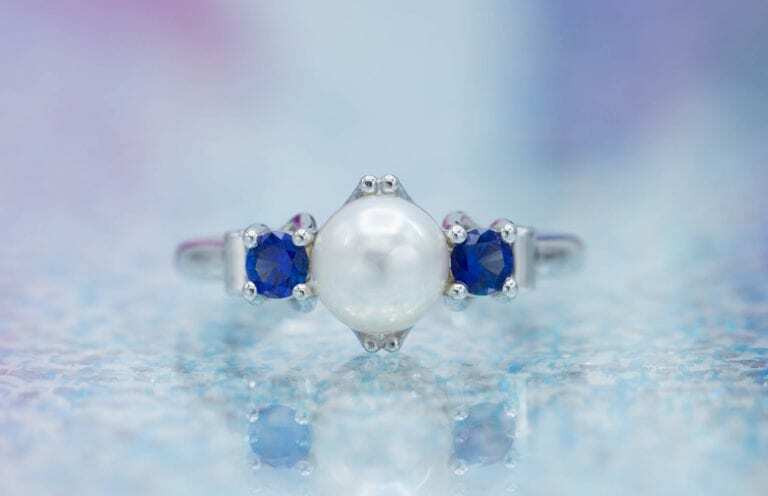 With heating, tanzanite can be blue to violet. Refractive Index Zoisite varieties, including tanzanite, have different RIs: 1.685-1.725. See "Identifying Characteristics" below. Specific Gravity 3.09-3.38. (Tanzanite 3.35). Varies by zoisite variety, see "Identifying Characteristics" below. Birefringence Zoisite varieties, including tanzanite, have different birefringence values: 0.004-0.009. See "Identifying Characteristics" below. 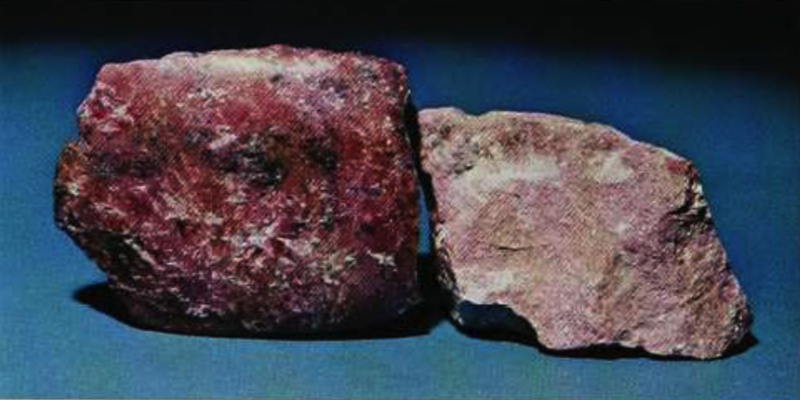 Luminescence Thulite (pink zoisite) from Nevada is sometimes medium pale brown in SW. Also thulite from North Carolina is orangey-yellow in LW. Enhancements Virtually all tanzanite is heat treated. Coatings to improve color and luster, some coatings add iridescence. Transparency Tanzanite is transparent. 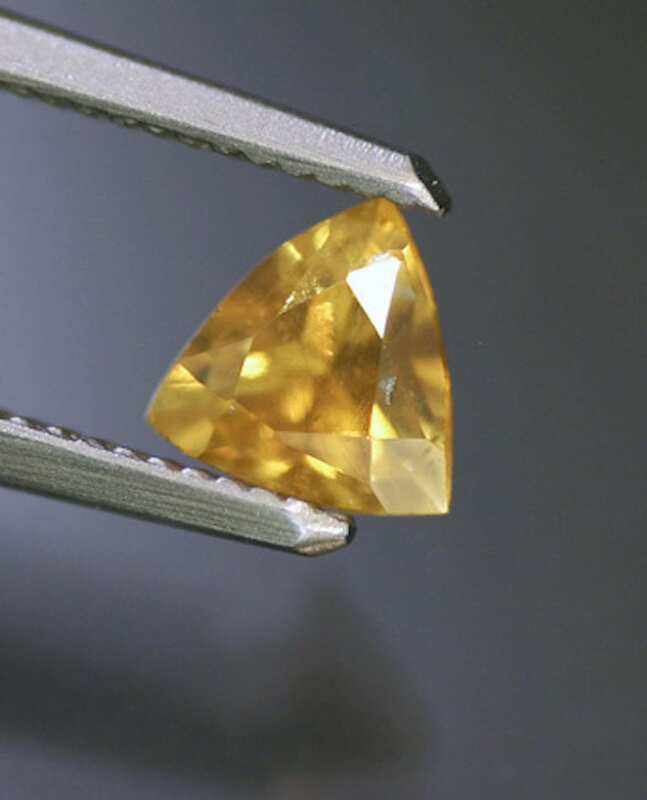 Other gem-quality zoisites may be transparent to opaque. Absorption Spectrum Tanzanite: broad absorption in the yellow-green centered at 595 nm, weak bands at 528 and 455 nm, and a few weak lines in the red. Phenomena Chatoyancy (rare, tanzanite). Surface coated/enhanced tanzanites may show iridescence, but this is not a natural property. Very strong. See “Identifying Characteristics” below. Zoisites, including tanzanite, are Biaxial (+). However, thulite is Biaxial (-). Zoisite varieties have varying optic properties. See “Identifying Characteristics” below. Zoisite is named after Baron Sigmund Zois, who presented the first specimens of the material to Abraham Gottlob Werner, the great mineralogist. Thulite is named after Thule, an ancient name for Norway. Anyolite comes from the Masai anyoli for “green.” Tanzanite is the Tiffany & Co. trade name for blue zoisite, named after the country of origin, Tanzania. Zoisite occurs in calcareous rocks such as metamorphosed dolomites and calcareous shales subjected to regional metamorphism. Zoisite may contain fingerprints, healed cracks, and growth tubes. Minerals found included in tanzanite include actinolite, graphite, and staurolite. 7-ct blue-violet tanzanite, re-polished by Daniel Stair. © Dan Stair Custom Gemstones. Used with permission. 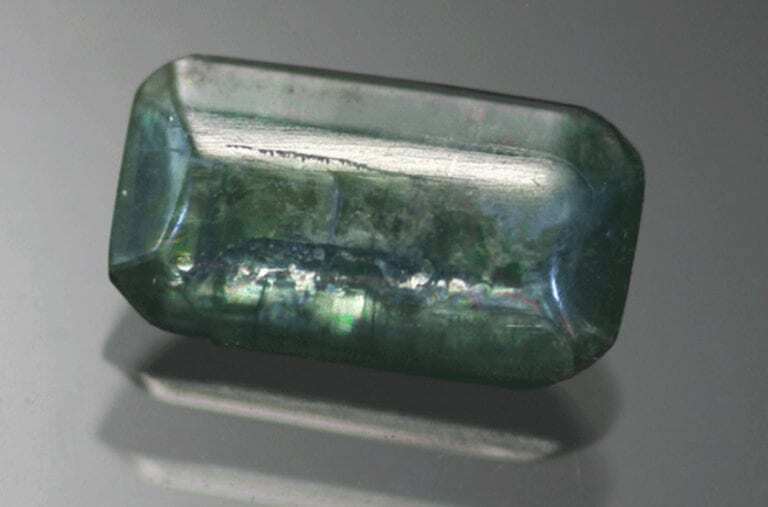 Before the discovery of tanzanite, the known varieties of zoisite made little impact on the gem market. Discovered in the shadow of Mt. Kilimanjaro in 1967, tanzanites show both dramatic color change and pleochroism. 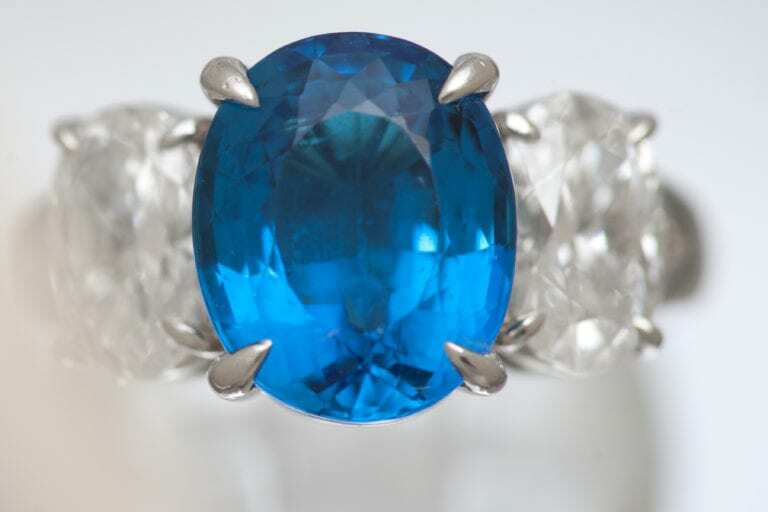 In natural light, tanzanites can appear an almost sapphire blue. In fluorescent light, they may appear more violet or amethyst-like. 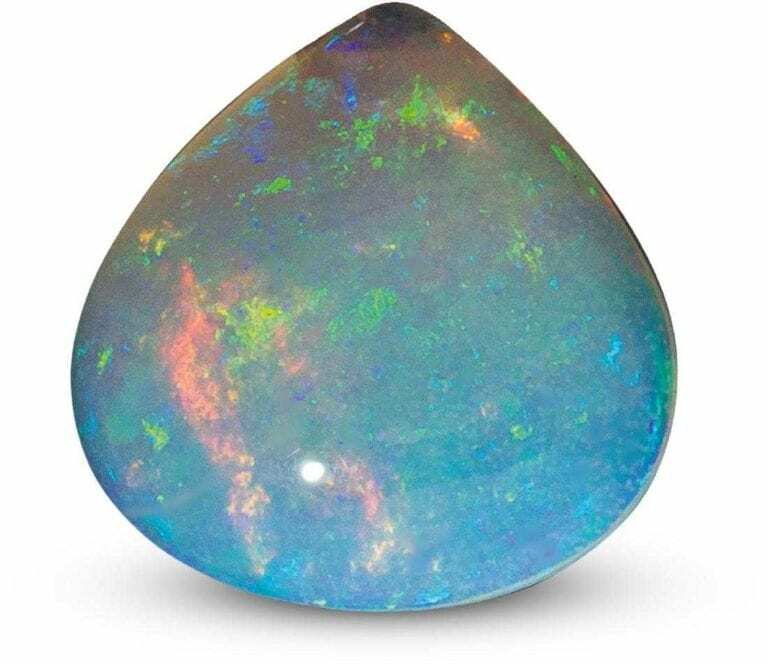 Naturally trichroic, these gems can show blue, red-violet, and yellow-green colors when viewed through each of its three crystal axes. Their most coveted property, however, is their blue to violet color. Although Mother Nature very rarely produces a blue to violet stone in the rough (via the slow heat of the Sun), almost all tanzanites must receive artificial heat treatments to achieve that coveted color. Typically, they’re heated to about 500-600º C or 932-1,112º F.
Tanzanite will certainly appeal to those interested in a truly modern gemstone. However, other gem-quality varieties of zoisite deserve mention, too. Tanzanites include only blue to violet zoisites. Thus, transparent, gem-quality zoisites in any other color should be called zoisites. 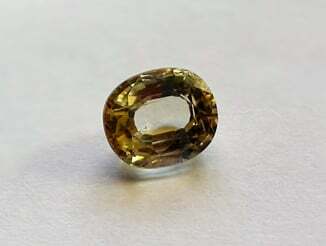 “Zoisite,” faceted “wine-yellow” specimen, 1.44-ct, Tanzania, by DonGuennie. Licensed under CC By-SA 4.0. The national gemstone of Norway, this pink, translucent to opaque material can make beautiful cabochons. 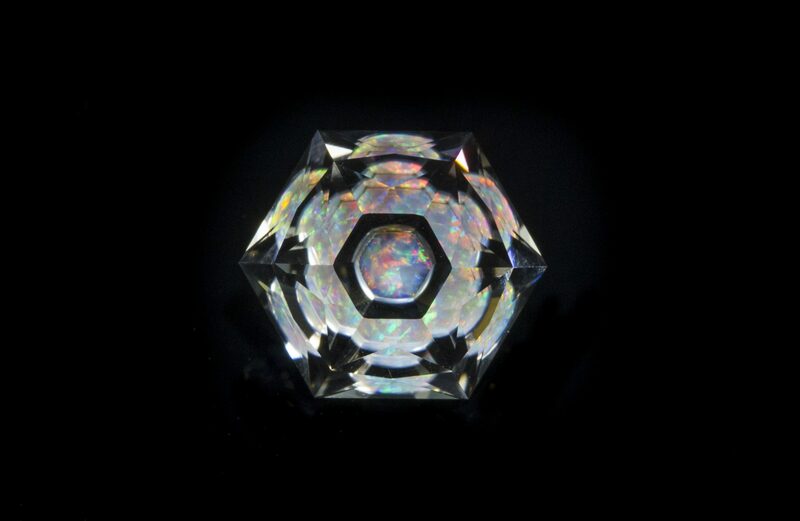 Faceted pieces are rare. Trade names for thulite include unionite and rosaline. “Thulite,” earrings, Kitimat, British Columbia, Canada, by pensondesignergems. Licensed under CC By 2.0. 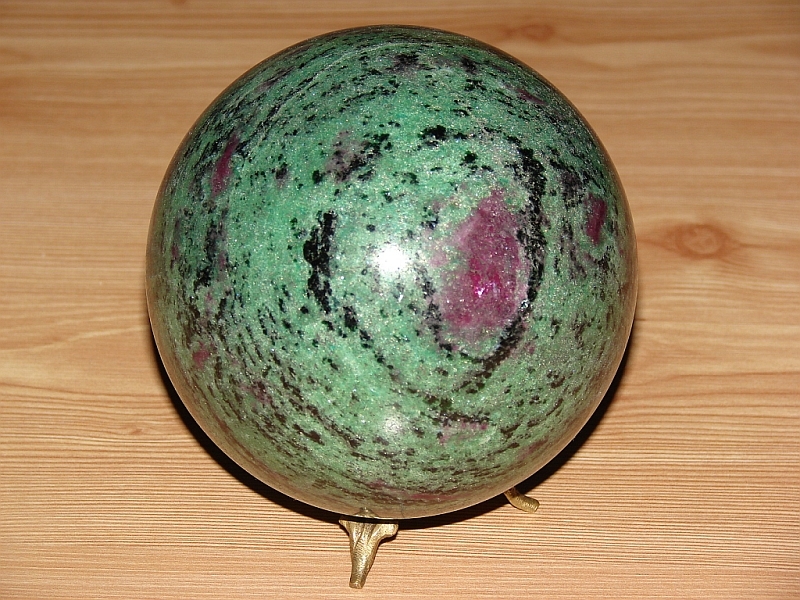 This lapidary rock contains chrome-rich green zoisite, black hornblende, and large, but opaque, ruby. 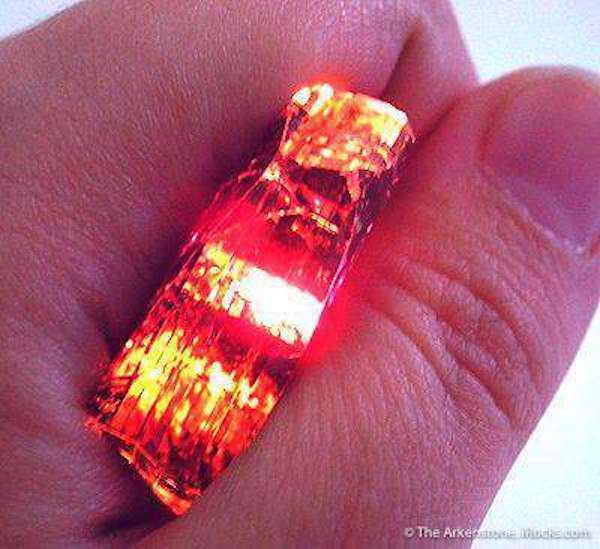 Gem cutters can make cabochons and carvings from this material. This material is also known as ruby-in-zoisite. “Anyolite,” carved ball, 120 mm, Tanzania, by Adam Ognisty. Licensed under CC By-SA 2.0. (Violet color) Reddish purple/blue/yellowish brown. Above, this strongly trichroic tanzanite crystal shows blue, purple, and red/maroon along different axes. 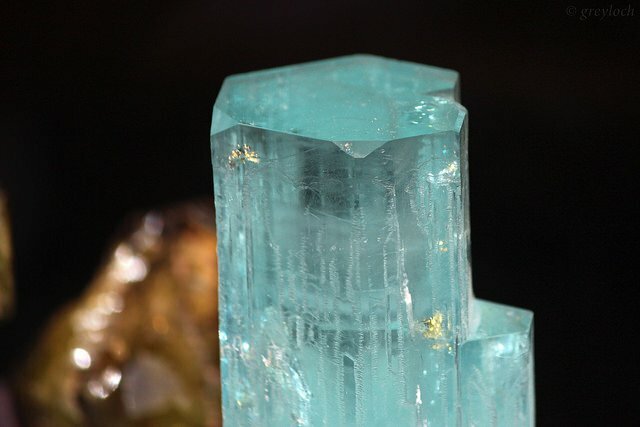 Crystal 3.3 x 3.1 x 1.5 cm, Merelani Mines, Tanzania. © Rob Lavinsky, www.iRocks.com. Used with permission. To date, synthetic tanzanite is unknown. However, many simulants (imitations) do exist. Consult our buying guide for more information. Assume all blue to violet tanzanites have received heat treatment. This is a stable treatment. Unheated tanzanite, showing natural color range (~ 0.5 to 5). Photo © Joel E. Arem, PhD, FGA. Used with permission. The sole source of tanzanite is the Merelani Hills in the Lelatema Mountains, Tanzania. 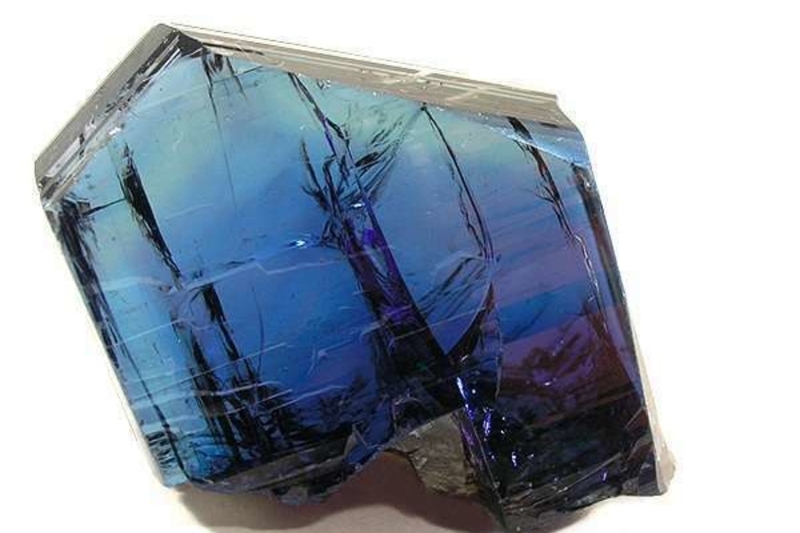 The mines here produce fine blue to violet crystals, up to large size, and often gemmy. 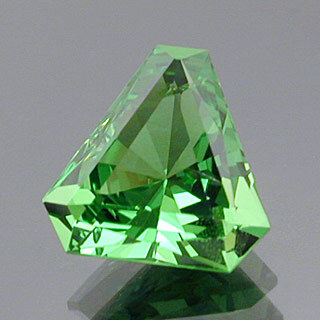 Longido, Tanzania produces deep green crystals, colored by chromium, with ruby crystals. United States: California; Nevada; North Carolina; Washington. Zoisite: Thulite, Norway (each specimen ~ 2 inches across). Photo © Joel E. Arem, PhD, FGA. Used with permission. United States: Massachusetts; South Dakota; Wyoming (greenish-gray material, sometimes tumble polished for jewelry). Austria; Finland; Germany; Baja California, Mexico; Pakistan; Russia; Scotland. 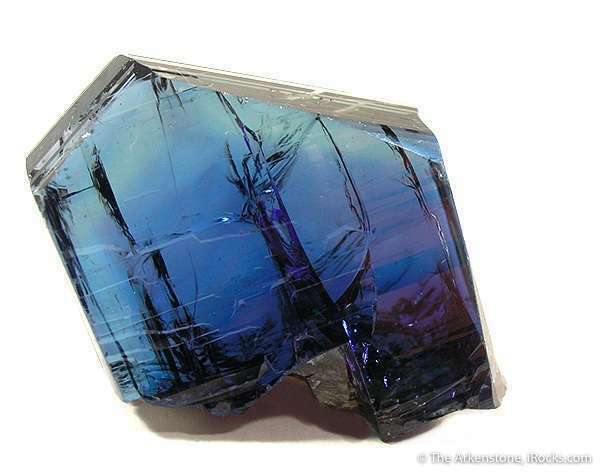 Tanzanite, alone of all zoisite varieties, reaches large large sizes in faceted gems. Rough tanzanite crystals weighing hundreds of carats have been found. Smithsonian Institution (Washington, DC): 122.7 (blue, tanzanite, Tanzania); 18.2 (blue cat’s eye tanzanite, Tanzania). 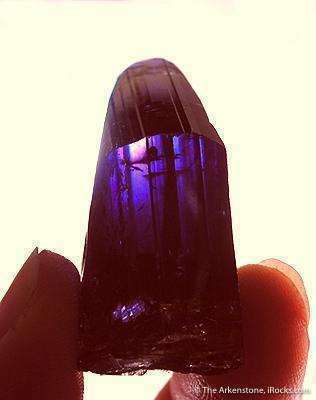 Private Collection: 220 (blue, tanzanite, Tanzania). For faceting and gem design recommendations for tanzanites and other zoisite varieties, read this article. 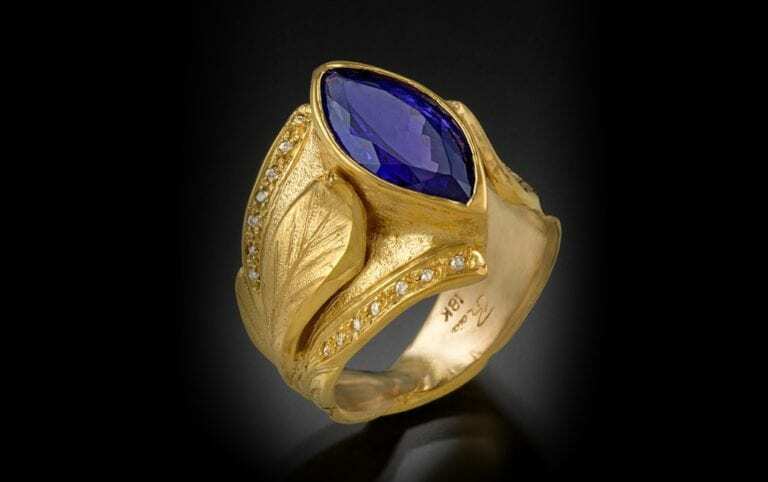 Although tanzanite hardness may range from 6 to 7, its tendency to cleave and brittleness pose hazards for daily wear. Reserve these gems for occasional pieces or use protective settings. Clean them only with a soft brush, mild detergent, and warm water. For more recommendations, consult our gemstone jewelry care guide. Tanzanite. (26.54). Photo © Joel E. Arem, PhD, FGA. Used with permission.